They are Universal Size, Suitable for Most Cars. 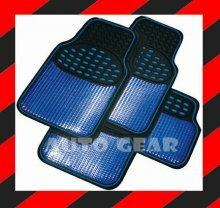 The Mats are Rubber and can be easily Cleaned. Moulded cut lines to to trim for perfect fit. Heavy Duty Rubberised Anti Slip Backing. Please Note that this item is Classed as a Universal Fit therefore no exact Application or Suitability guide is available. Other Colours also available in our eBay shop.